A news release put out Tuesday afternoon by Friends of Beyond Baroque makes it sound as though someone was duped, discombobulated, or maybe just plain defiant when the Los Angeles City Council resolved in February to renew the venerable arts organization's lease in Venice. After a delay of four months since the unanimous passage of the Los Angeles City Council's Resolution of February 29, 2008 renewing Beyond Baroque's lease to all its current space at 681 Venice Blvd., for the next 25 years, the lease remains unsigned. 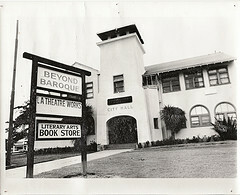 We have learned from sources inside City Hall that, contrary to the City Council Resolution of February 29, 2008, Beyond Baroque, a nationally recognized cultural institution based in Venice, may lose the part of the lease pertaining to its historic theater, the heart of its operations since 1979. Loss of the lease to its historic theater would cripple Beyond Baroque's control over its future and severely impair its capacity to represent and serve the community as it has for forty years. Los Angeles City Councilmember Bill Rosendahl said in February 2008 that Beyond Baroque had been saved after the City Council unanimously approved his motion to direct city agencies to renew and extend a low-cost lease intended to allow Beyond Baroque to keep its headquarters at 681 Venice Blvd. through 2032. No public mention was made at that time of any plans to subdivide the building. *UPDATE: See updated post here. Click to e-mail TJ Sullivan.